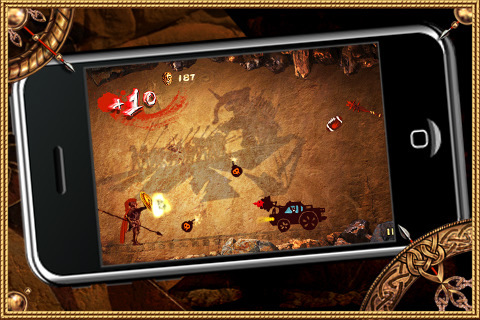 Spartan Hero, the brainchild of Dragon Team Interactive, is a game that’s hard to put down. Compatible with the iPad, iPod Touch, and iPhone, this game is fun and doesn’t take itself too seriously. Although it is single player, it has software that enables you to share your score online and interact with other players to display your achievements or trade some tips. One tip I have for the creators is this: find another way for us to move the shield up and down. As it is, my finger blocks my view of the Spartan every once in a while and I end up getting killed by a rogue spear. I guess this minor glitch is redeemed by the times the solider screams, “I AM SPARTA!” His face morphs into a comical mask of anger and spit flies out of his mouth. Be that as it may, I don’t think this game was meant for someone with a short attention span. While entertaining, it is also repetitive. Your player just walks in place while spears come flying at him from every direction. There is a special kind of spear with benefits that you’re supposed to receive instead of block with your shield. It can be tricky sometimes because not guarding yourself for a split second leaves you vulnerable to an onslaught of arrows. When an arrow does strike, a gush of blood flows out of the Spartan and the game is promptly ended. This game would keep my attention more if instead of starting all over again you were allowed a certain number of wounds. I say this because the first thirty seconds of the game is pretty slow and to endure it again and again as you try to get further can be incredibly monotonous. Even though the graphics are good and the sound effects are catchy, I feel this game would be better priced at $0.99 cents rather than $1.99, but if you have the spare change it’s not really an issue. Spartan Hero doesn’t require a terrible amount of skill or ingenuity, just a good eye and good reflexes. If you like blood, Spartans, or outlets to waste time this game comes highly recommended. If you prefer something more intellectually challenging, than don’t bother with this one; it’s just good, clean, mindless fun. Notes: Spartan Hero HD ($1.99) is a separate game that you can buy for the iPad from the same developer. A similarly named title is an iPhone game developed by Gameloft called Hero of Sparta. AppSafari review of Spartan Hero was written by Renata Paszterko on July 16th, 2010 and categorized under Action, App Store, Fun, Games, iPad apps, Sports. Page viewed 3784 times, 1 so far today. Need help on using these apps? Please read the Help Page.